Norma's Fantastic 80th Birthday Cake!! 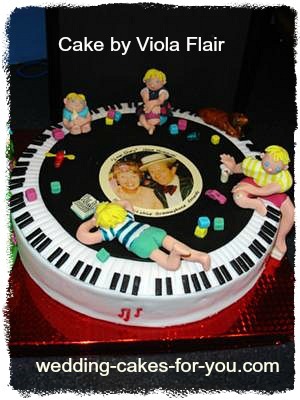 This Fantastic 80th birthday cake was for a family member named Norma - my mother and I made 2 yummy chocolate mud cakes & decided to make the number eight represent Norma's interests in life, like gardening, scrabble & card games....and the Number 0 her family (her boys as kids) and her love for dancing and music was also interpreted via the piano keys and the LP record. There are a few toys around even a New Zealand Buzzy Bee! There is a boy that reads a book - it has real readable text in it written an old style calligraphy pen and edible ink! I just love miniatures! This was my 2nd cake with fine details. I did the figure 0 by myself but shared the figure 8 work load with my mother. Making the miniature scrabble pieces, cards and flower seeds was fun. The good thing is the icing pieces can be made weeks in advance - which often helps with larger pieces to give them time to dry. The details took over 80 hours to make!! The figures were the hardest as they are so solid and take longer to dry and I had trouble with the baby holding the bottle as it slowly started sinking!! Ha do you ever get that sinking feeling! Tip I recently found out there is a powder that can be used to make solid pieces dry faster but have not tried it yet. When Norma did get the cake she wanted to take all the boys and other pieces off first before anyone was allowed to cut the cake!! She kept it for weeks after just to look at!! 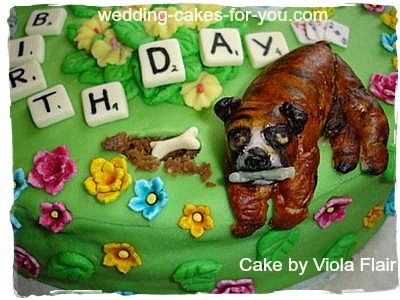 Amazing detail Viola! 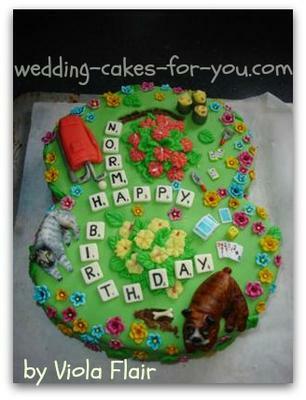 Thank you so much for entering Norma's fantastic 80th birthday cake. The mud cake sounds like it tasted very good too.